The more I use my iPad (1, 2 and now 4), the more I think I need a keyboard. With a decent keyboard I can essentially leave the laptop computer at home, even though the laptop is already a very lightweight one. With a decent keyboard, I can browse the web, jot notes, tweet, update Facebook / Linkedin / Google+ status and compose / reply emails easily … and that’s pretty much all the things I do day in, day out. So it’s like a mission to find the best keyboard for iPad. First, the original Zagg Solo – it’s a good one but not that protective. Then the updated Zagg ZAGGFolio – stylish, solid but heavy. Then I found a really good one – the Logitech Ultrathin Keyboard. It’s beautiful, lightweight, and with a comfortable keyboard. The only down side is that it cannot protect the iPad very well. That is the reason why I backed the Brydge + project in Kickstarter. From the project page, the keyboard certainly looks like the perfect keyboard – rock solid, good keyboard, and come with a speaker. 9 months (!) after the project get funded, I finally received the keyboard – it’s heavy, thick, and with sticky keys. You can check out the project comment page on how upset all the other backers are, in fact many still have not received their keyboards. I am still using this keyboard every single day, while waiting for the next one – Belkin Ultimate Keyboard for iPad or Logitech Folio Keyboard. Yes, the more I use my iPad, the more I think I need a keyboard. Without a keyboard like Kindle 2 / 3, the Kindle Touch is very small and lightweight. And with the same reason, you need to touch the screen to turn pages and change any settings … quite frankly touching the screen to action is not as easy as pressing a button in previous Kindle verions. However the E Ink display is still very good for reading. From the home screen (the book list screen), press the Menu button in upper right, and turn on the Wi-Fi (“Turn On Wireless” option). If needed, in the same menu, select “Settings” and use the “Wi-Fi Networks” option to connect to the right Wi-Fi Access point. Then register your Kindle with the “Registration” option in the “Settings” screen. Set the password of the device, the time and personal information with the “Device Options” in the “Settings” screen. Once connected, and registered, go back to the home screen and you shall be able to download all the books to the new Kindle one by one. Lastly, in case you want to take some screenshots of Kindle like what I did for this blog post, all you need to do is to hold the home button for a while and then tap the screen. The screenshot in GIF format will be stored in the root directory of the Kindle where you can copy to your PC once connected via the USB cable. Hope it helps. How many apps you have downloaded to your iOS devices ? And is it easy to find them from within the devices – then run your favorite game or utility apps, move them or delete them ? Yes I know many of you have your favorite apps in the home screen and you can organize the apps into folders as well … but more questions pop up – how to name the folders ? How to arrange the folders ? And is it easy to find the folders you created last week or month in your iPhone / iPad ? iPhone and iPad are smart devices but you need to be very smart as well one way or the other, to make that device works for you. Other than downloading good apps, I firmly believe you also need a smart(er) way to organize your apps and folders – and in turn, better user experience. First, only download the apps your need. A simple but important trick, for example, if you don’t play games at all then why download the Angry Birds ? 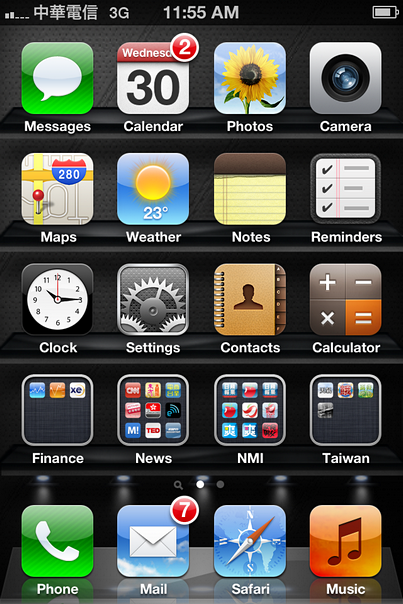 Second, organize all standard Apple apps (Clock, Calendar, Contact, Map etc.) in the home screen of the device. With this approach, when you know you need to run those standard Apple apps, just go to the home screen to find it. Free up your mind, you don’t need to memorize where are those apps – like, where is the Map apps ? However, if there are really some Apple standard apps you don’t need in the home screen – save those into a separate folder, say “Apple apps”. Always leave a row in the home screen for your apps and folders though, in other words, only keep at most 12 standard Apple apps in the home screen (in the case of iPhone). That will leave you 4 “slots” to place your own apps or folders. 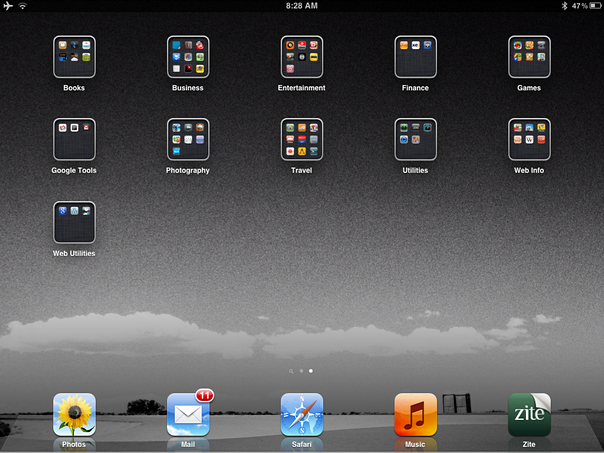 For iPad, keep 15 standard Apple apps in the home screen and leave 5 “slots” for the apps folders. 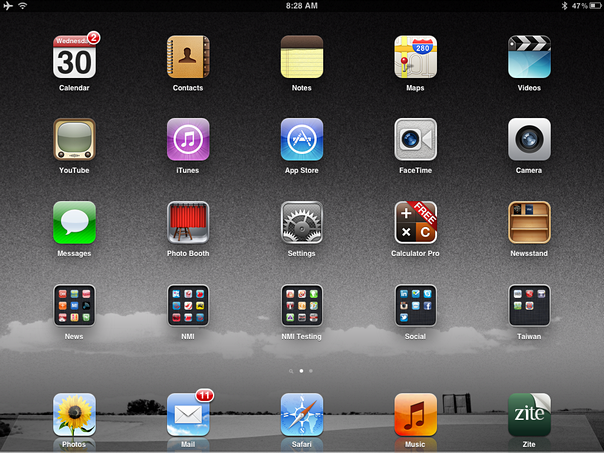 In the case of iPad, you can also move one of your favorite apps to the apps docking bar in the bottom of the screen. In my case, I added Zite to it. In the home screen, keep the most used apps on the left most column (if you are a right-handed person), or the right most column. That will help you to access your favorite apps with only one hand and your thumb. Probably the most important tips – sort your folders position by their names. For example, place the folder sequence like “Finance”, then “Games”, then “Health” etc. That will help you easy to find one folder just by a glance to the screen. In other words, if you want to find the folder “Health”, the first glance of the screen you found “Finance” and you will certainly know the “Health” folder is somewhere on the right or below the folder “Finance”. No more folder hunting. Keep the folders names the same between iPhone and iPad. So you can easily find the same apps in the same folder. Lastly, review the apps and folders once every few months – remove the apps that no longer needed; rename the folders or create new ones if new needs arose; reorganize the folder position again. I hope all these tips and tricks make sense to you, following you can find few screen shots of my iPhone and iPad set up.